The Mountain Home Elks Lodge No. 1714 has donated $2,000 to the local Backpack Food 4 Kids program. The program provides Mountain Home school children with weekend meals to help alleviate hunger. 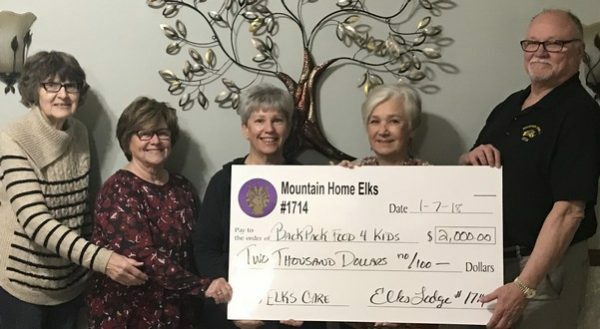 Photo (from left): Kathy Bauer, Linda DeMass, Jo Strickland, co-directors of the backpack program; Sherie Brown, Elks grant coordinator; and Wayne Markham, Elks president.